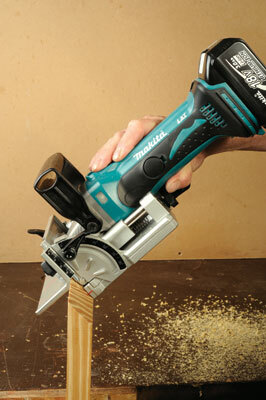 Makita have shown their support for this type of jointing method by giving us no less than four different models. It seemed only right to try the new BPJ180 LXT cordless biscuit jointer to see if it presses all the right buttons. Is there a good reason for a cordless jointer as opposed to a trailing lead? I suggest yes, hauling a jointer around even on the bench can be a pain with a lead snaking behind, although an extraction hose is essential so maybe that isn't a great example. OK, think about shopfitting or kitchen installation with very little power available on site, then a cordless tool and dustbag would come into its own. Weighed against that quite literally, is that the 18v model - and presumably the 14.4v too - is quite heavy and ungainly with a lot of back end battery weight. 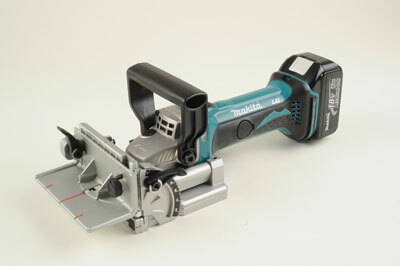 Looking at Makita's product lineup the body is straight off their LXT angle grinders married to the front end mechanism from the newish, corded PJ7000 biscuit jointer which incidentally has an all up weight of 2.5kg compared to the bare weight of this model of 3kg before you add the battery! However, the front is well designed and builds on the older corded 3901 model with its similarities to Bosch's machine. The handgrip and levers are a very tough grade hard plastic that won't give up. The plunge rods are very smooth and well sprung with six depth settings although the chrome turret stop marks are hard to read. The fall front has three click stop positions as well as being settable at any angle from 0-90º. The rise and fall front moves easily but waggles, although it locks square. Blade access is quick; just undo a knob and the case falls open. There are all the required centreline marks and a vision slot for lining the machine up when jointing. Flat rubber buffers either side of the blade slot reduce the chance of kickback and LEDs on the body indicate overload or unsafe conditions. Makita have effectively turned a cabinetmaking tool into a construction tool by adding all the encumbrance of a long body and battery weight which is a bit self defeating. It's also a shame the battery doesn't hang down a fraction lower as it would make the machine sit dead flat on a surface. However, it does what biscuit jointers should do and accurately. It is a well built tool and should last for ages. The noise level is pleasantly low. A very good addition to existing LXT kit when working on site.